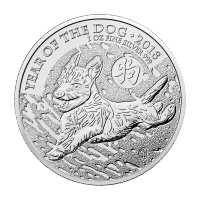 Order your 1 oz 2018 Perth Mint Lunar Year of the Dog silver coin from our online shop today for the lowest price! This globally celebrated series from Perth Mint features one of the 12 zodiacal animals in the Chinese lunar calender with each release, this year marks the 11th edition and is the turn of man's beloved best friend, the dog, to feature. On the reverse, one of the world's most beloved family pets, the German Shepherd, portrayed resting in the grass here, with her adorable pup; the pair are rendered in astonishing detail and with the addition of vibrant full colour. Also on the reverse, China's national flower, the lovely peony, the Chinese character for 'dog,' as well as the 'Year of the Dog' title. On the obverse, Ian Rank-Broadley's meticulous portrait of Elizabeth II, shown in crisp relief and without colour. Also on the obverse, Elizabeth II's name, the country of origin, weight, purity, denominational value and year of issue. Those born under the year of the dog are said to share in its characteristics, displaying loyalty, friendliness and unconditional love; they include those born in 1970, 1982, 1994, 2006 and 2018. 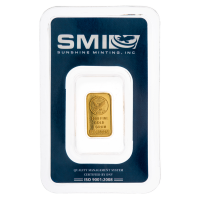 Celebrate the year of the dog and fortify your holdings with a 1 oz 2018 Perth Mint Lunar Year of the Dog silver coin today! In multiples of 20, this coin will come in a mint roll. 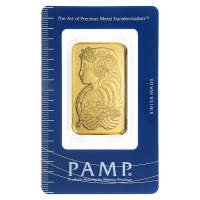 In multiples of 100, these coins will ship in a Perth Mint box. 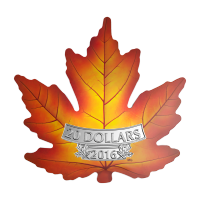 Obverse Effigy of Queen Elizabeth II with the words "Elizabeth II Australia 1 Dollar 1 oz 9999 Silver 2018"
Reverse A coloured image of two dogs laying attentively. Effigy of Queen Elizabeth II with the words "Elizabeth II Australia 1 Dollar 1 oz 9999 Silver 2018"
A coloured image of two dogs laying attentively. 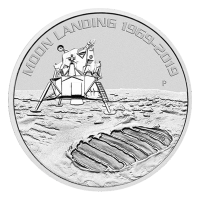 1 oz 2018 Perth Mint Lunar Year of the Dog Colourized Silver Coin Order your 1 oz 2018 Perth Mint Lunar Year of the Dog silver coin from our online shop today for the lowest price! 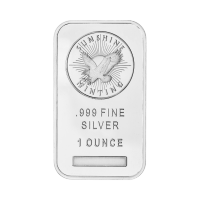 This globally celebrated series from Perth Mint features one of the 12 zodiacal animals in the Chinese lunar calender with each release, this year marks the 11th edition and is the turn of man's beloved best friend, the dog, to feature. On the reverse, one of the world's most beloved family pets, the German Shepherd, portrayed resting in the grass here, with her adorable pup; the pair are rendered in astonishing detail and with the addition of vibrant full colour. Also on the reverse, China's national flower, the lovely peony, the Chinese character for 'dog,' as well as the 'Year of the Dog' title. On the obverse, Ian Rank-Broadley's meticulous portrait of Elizabeth II, shown in crisp relief and without colour. Also on the obverse, Elizabeth II's name, the country of origin, weight, purity, denominational value and year of issue. Those born under the year of the dog are said to share in its characteristics, displaying loyalty, friendliness and unconditional love; they include those born in 1970, 1982, 1994, 2006 and 2018. 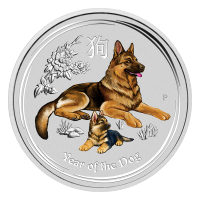 Celebrate the year of the dog and fortify your holdings with a 1 oz 2018 Perth Mint Lunar Year of the Dog silver coin today!